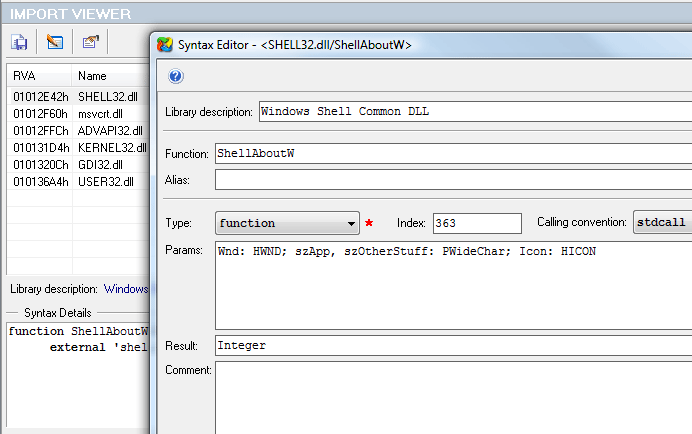 PE Explorer: DLL Exported Function List Viewer, Get DLL Import, DLL Exported Function Arguments Syntax Lookup. The bundled library descriptions are derived from Delphi and other third party sources and follow the Pascal declaration syntax and use data types appropriate to those sources. The Syntax Description Editor is specifically designed for adding custom comments, altering values or creating new library description. Changes are stored in a user directory apart from the bundled descriptions to provide an element of safety.